Founder of JOLIEGAZETTE, Juliet Belkin and a high-end Jewelry store with unique, contemporary designs, owned by and named after its owner, Stuart Moore hosted a magical Silver Belles Soirée in the heart of Union Street, an east-west street in San Francisco known for amazing shopping. The event showcased permanent exhibitors at the galleries of Stuart Moore such as Henrich & Denzel, the best in classic-modern platinum, Niessing, creator of the tension set ring, Carl Dau, the best minimalist, Ulla & Martin Kauffmann, incredible sculptors of gold, Andre Ribeiro, rubber, no kidding, set with diamonds, Antonio Bernardo, bringing a little touch of ‘tango’ and Dionea Orcini, cosmic constellations and sacred legends. Select group of privileged guests had the opportunity to preview some of these fabulous Stuart Moore jewels while sipping on Gary Farrell Winery wines from the heart of the Russian River valley. Terrific service, wonderful contemporary designs and a comfortable place to shop. 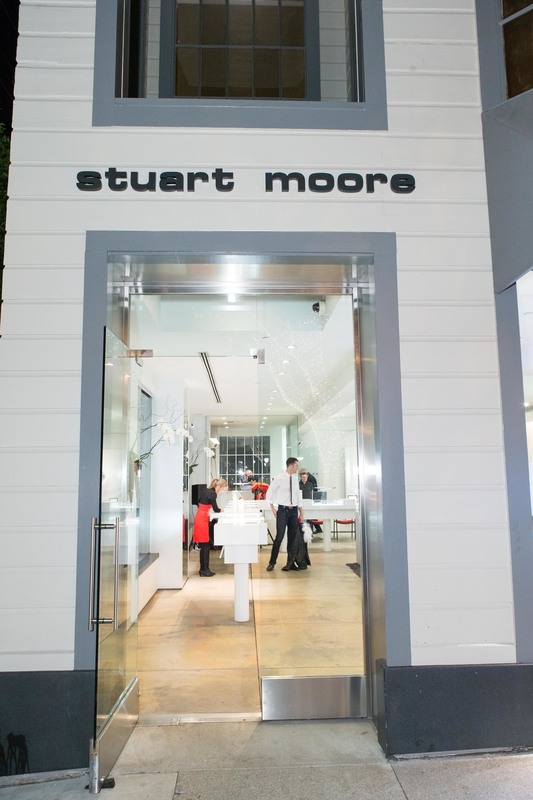 This is what you will experience at the boutiques of Stuart Moore. And if you run into its charming owner, you'll be amazed at how engaged and thoughtful he is.